A greenhouse is a structure with a controlled environment used to grow tender plants when it is too cold to grow them outdoors. Greenhouses are typically constructed with a clear membrane of plastic or glass for sunlight to pass through. The membrane traps solar radiation to heat the greenhouse. In recent years advances in plastic manufacturing have made greenhouse plastic less expensive. Because of this, many gardeners may build their own hobby greenhouse. Once a hobby greenhouse owner erects the frame, they must wrap the greenhouse in greenhouse plastic. Measure the exterior surface of your greenhouse. To do this, measure the width, length and height of each greenhouse panel. Then add the dimensions together to get the complete greenhouse exterior surface. Add 10 percent to this figure as extra waste plastic for mistakes. Most greenhouse plastic manufacturers ship greenhouse plastic in rolls. Unroll 1 foot of the plastic from your greenhouse roll to determine the way in which the greenhouse plastic is wrapped around the roll. This will determine how you will cover your greenhouse. Some greenhouse plastics are comprised of a single layer wrapped around a tube, while others are folded using a U, W or Y fold before rolling. 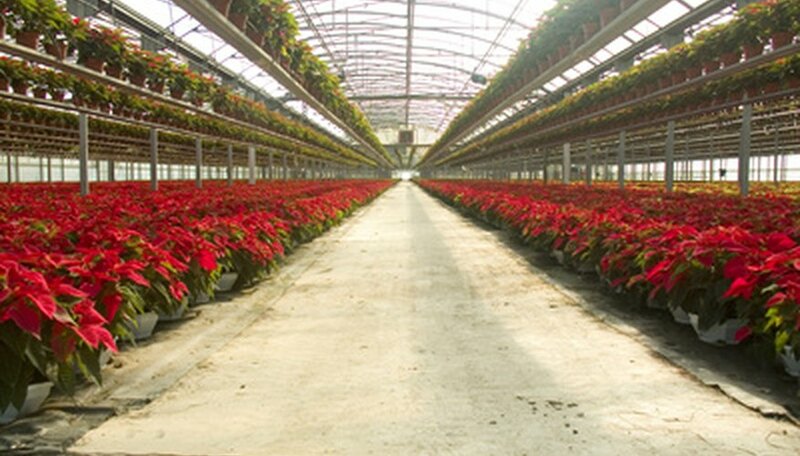 Install the film for your greenhouse as late in the planting season as possible to prevent wear and tear. Place the film on the greenhouse early in the morning when there is little wind and cool temperatures to avoid stretching and breaking. Unroll the greenhouse plastic across the gable of the greenhouse and down each sidewall. Then unfold the plastic lengthwise until each side touches the ground. Maintain a 3 percent slope around the surface of the greenhouse to provide adequate runoff. Fold loose greenhouse fabric at the corners of the sidewalls until the greenhouse is taut. Tape the loose fabric down with greenhouse tape. Attach the greenhouse plastic along the base of your greenhouse with polylocking devices. Polylocking devices hold the greenhouse plastic in place.